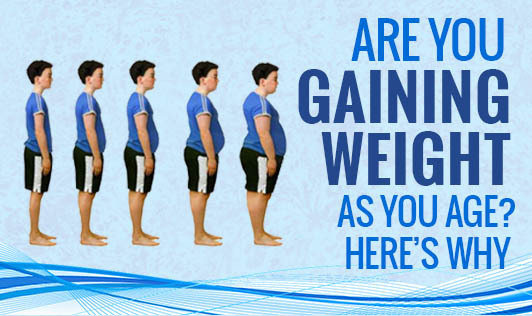 Are You Gaining Weight As You Age? Here's Why! Age is not merely the period of time one has lived, or of the physiological changes the body goes through during the course life. It is also a product of the social norms and expectations that apply to each stage of life. Age represents the wealth of life experiences that shape whom we become. The aging process brings about many changes in body composition, often without concomitant changes in body weight. As individuals age, percent body fat increases while lean mass and bone mineral density decrease. The increase in fat mass is more specifically localized in the abdominal region, a body part more commonly associated with cardiovascular disease and diabetes. BMR (Basal Metabolic Rate)* is reduced in old age, reason being the reduction of muscle mass in the body. Mostly, age-related weight gain is due to a dramatic decrease in the calories burned. It is also due to the decrease in the BMR (Basal Metabolic Rate) - an older person tends to put on more weight when compared to the younger individual. This is because energy expenditure decreases with age resulting in decrease in body metabolism. BMR decreases with age; by 4 - 5% per decade. This happens after the person has reached 20 years of age. The decline is due to the increase in the fat mass. It becomes more rapid after the age of 40 in men and 50 in women. The number of calories burned per day decreases with age, thus, triggering easy weight gain. *Basal Metabolic Rate is the rate at which the body uses energy while at rest to maintain vital functions such as breathing and keeping warm.